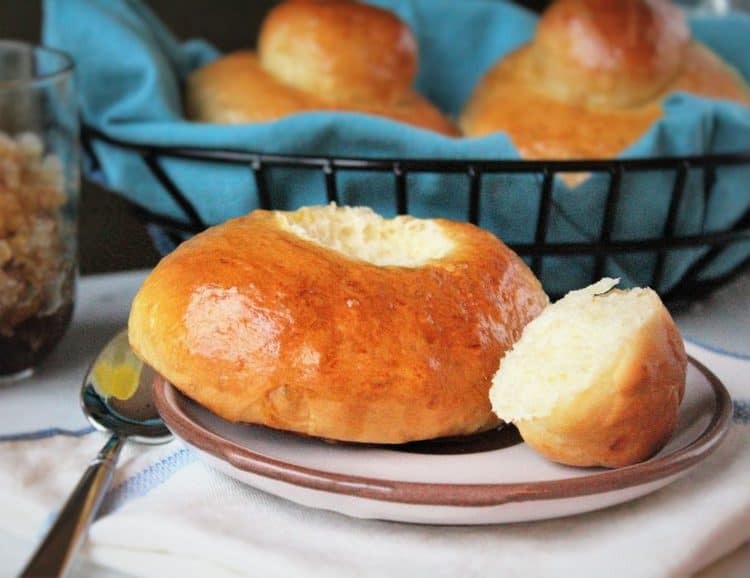 Now you can enjoy your authentic Sicilian Brioche, just like you enjoyed in Sicily, at home! Serve with gelato, granita or as is! Picture it. Sicily 1991. A young woman visits her parents’ hometown in Sicily for the first time. She is at her nonna’s home in the outskirts of a tiny medieval village located high on a hilltop. The young woman is sleeping in her nonna’s bedroom with the shutters drawn tight to keep out the morning sun. Suddenly, she is awakened by the sounds of a man shouting unintelligible words into a megaphone in a heavy Sicilian accent. This was the Sicilian Brioche man making his morning deliveries. That morning, she has her first taste of brioche for breakfast and falls in love. My dear friends, that young woman was me! Fast forward 25 years later. I am back in Sicily, once again enjoying my brioche, this time with my husband and children. Since we are not staying up in the hilltop village as last time, I’m not sure if the morning brioche man is still making his rounds. I obtain the recipe for brioche by a local cook. When I return home, I finally attempt to make them for the first time. 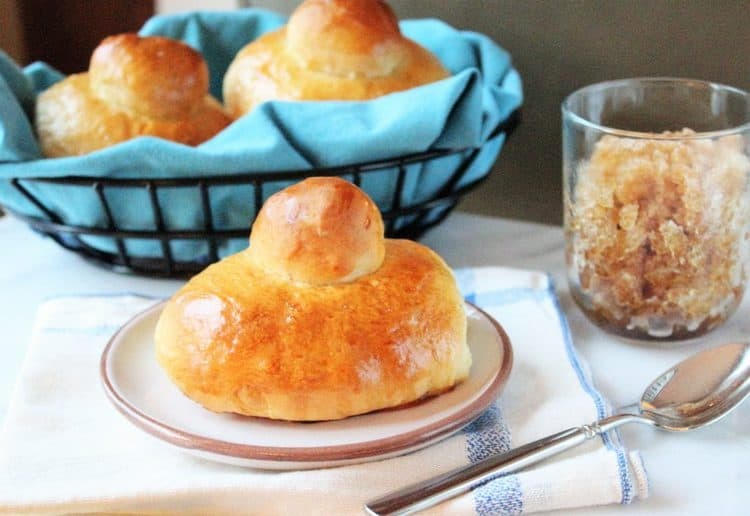 What makes these brioche Sicilian? I am frequently asked what makes these brioche distinctly Sicilian. That is because they are found mainly in Sicily. For the most part, because on this recent trip I saw similar ones referred to as Sicilian brioche in different parts of Italy. The tuppo on top is characteristic of these brioche. Now let’s talk a about how you eat brioche when you’re in Sicily. You can have one for breakfast; at snack time around 10:00 am sitting at the bar with your friends; or as a late night snack sitting at the bar with your friends! So basically, all day long. The first step is to remove the tuppo, the cute little bun on top, and pop it into your mouth. You do not eat one on it’s own. A brioche is often accompanied by granita available in various flavors such as traditional lemon, coffee, strawberry, pistachio, and so on. You can also top your granita with fresh whipped cream. Are you drooling now? The other way to eat brioche, which I learned from my cousin, is split it in half and stuffed with gelato. But unfortunately we are not in Sicily and do not visit the bar on a daily basis with friends on a hot blistery day. Therefore, we (particularly my children) enjoy them cut in half and spread with Nutella. Oh well, we gotta make do! Watch my step by step video on how to make Sicilian Brioche! -The recipe calls for brewer’s yeast, which is sold in bakeries by the pound. You can also replace it with 1 envelope of traditional dry yeast. -I bought 00 flour in my local Italian grocery store. 00 flour is an extra fine flour and is ideal for making bread, pizza and focaccia as well. Unfortunately it costs twice as much as regular four, but is well worth it. You can replace it with regular all-purpose flour. -For best results, use a kitchen scale to weigh the base and the tuppo of the brioche in order to have equally shaped brioche. -In order to nestle the tuppo deep within the base of the brioche, brush the brioche with egg wash before placing the tuppo on top. The egg will act as a glue and prevent the tuppo from falling out. -After they have risen you may notice some of the tuppo may be off centered and lopsided. Resist the urge to nudge them back in the centre of the brioche as they will deflate. Trust me, I know. You will simply have a brioche with an off center tuppo. -The original recipe also called for placing the brioche in the oven with the light while they rise. The heat from the light helps them to rise. It does make a difference! -If you don’t plan to eat them the same day, or at most the next morning, I recommend you freeze the brioche. Take them out of the freezer the night before you plan to eat them. In Sicily, they are only eaten the day that they are purchased, you will never have leftover brioche the next day. That’s why you have the delivery man making his morning rounds! 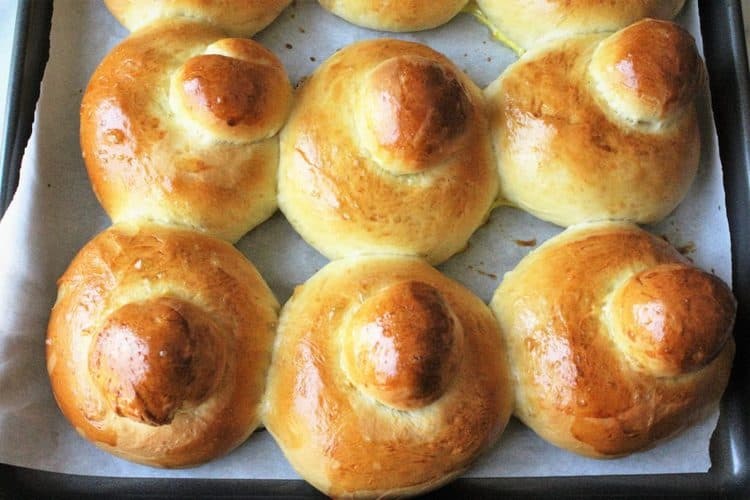 Now you’re ready to make your own brioche! When you do try out this recipe, please tag me with your lovely photos with @mangiabedda or #mangiabedda on Facebook or Instagram. Feel free to share this recipe with your friends by clicking on the social media buttons on this page. Buon appetito! Sicilian brioche are the ultimate treat enjoyed in Sicily for breakfast, midday or evening snack, basically any time of day. Best enjoyed with granita or cut open and stuffed with your favourite gelato! Warm the milk, transfer to a bowl and crumble the cube of yeast over the milk. Allow the yeast to dissolve in the milk while you prepare the remaining ingredients. It will not completely dissolve in the milk as traditional dry yeast will. Meanwhile, in the bowl of your mixer with a dough hook attached, add the sifted flours, salt, and sugar. Add the eggs, lightly beaten, butter, honey and orange and lemon zest and mix on the low setting until just combined. With the mixer running on low speed, slowly add the milk/yeast mixture. When the dough has come together, increase the mixer to the next speed for about 5 more minutes. The dough is slightly sticky but do not add more flour to it. When the dough is soft and elastic, transfer to a bowl and cover. Place in the oven with the light on and let sit for an hour. After an hour, divide the dough into 12 -90 gram balls. Remove a 15gram portion from each ball in order to form the "tuppo". Brush with egg wash (mix 1 beaten egg with 1 tbsp of milk) then make a deep indentation in each ball using your thumb and nestle the "tuppo" in the base of the brioche. Brush the tuppo with egg wash as well. Transfer to a parchment paper covered baking sheet and continue with the remaining dough. Place in oven with the light on and allow to rise for 3 hours. 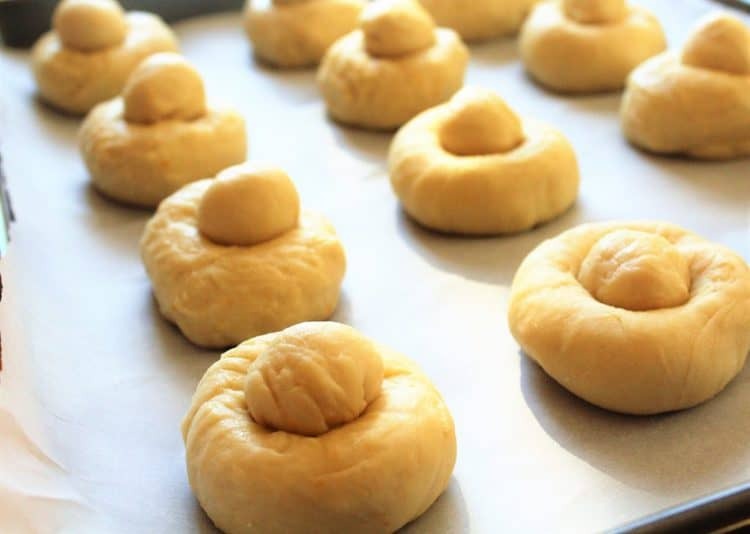 Bake in the centre of the oven for 20 minutes or until the brioche are golden in color. Cool before serving. 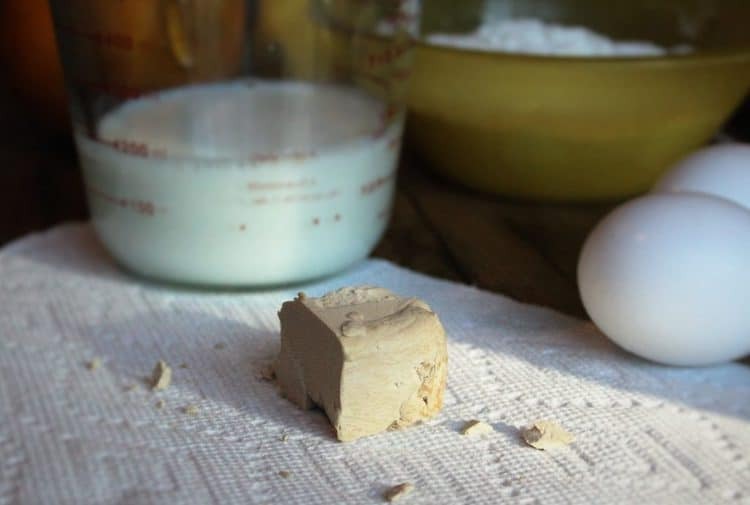 -The recipe calls for brewer's yeast, which is sold in bakeries by the pound. You can also replace it with 1 envelope of traditional dry yeast. -I purchase 00 flour in my local Italian grocery store. 00 flour is an extra fine flour and is ideal for making bread, pizza and focaccia as well. Unfortunately it costs twice as much as regular four, but is well worth it. But you can also use regalar all-purpose flour. -For best results, use a kitchen scale to weigh the base and the "tuppo" of the brioche in order to have equal shaped brioche. -In order to nestle the "tuppo" deep within the base of the brioche, brush the brioche with egg wash before placing the tuppo on top. The egg will act as a glue and prevent the tuppo from falling out. 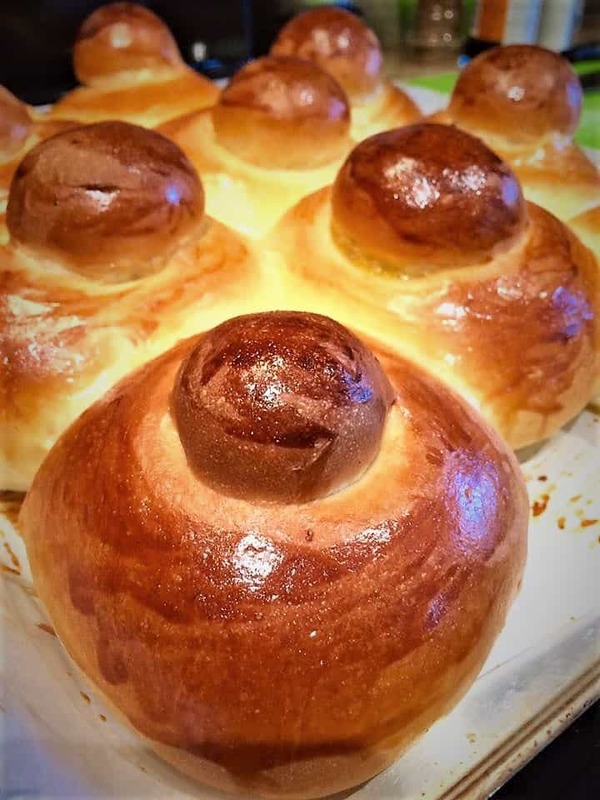 -After they have risen and you notice any of the "tuppo" that may be off centered and lopsided, resist the urge to nudge them back in the centre of the brioche as they will deflate. 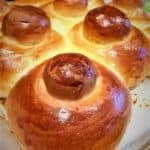 You will simply have a brioche with an off center "tuppo" and that's ok.
-The original recipe also called for placing the brioche in the oven with the light on in order to make them rise. The heat from the light helps them to rise. It does make a difference! -If you don't plan to eat them the same day, or at most the next morning, I recommend you freeze the brioche and take out what you need the night before. Your post brought me back to the time when I was eating these brioches filled with gelato for breakfast when I was in Sicily. Happy times!Thanks for sharing your recipe! Did you purchase the yeast in Laval? Yes indeed they were happy times! Such great memories associated with food! Yes I bought the yeast at a local bakery in Laval. Not expensive at all. So do I, especially when eaten by the sea in Sicily!